I finally got around to trying a recipe that always gets top reviews — Nick Malgieri’s Supernatural Brownies. Made with a mixture of brown sugar and granulated plus loads of bittersweet chocolate, they are dense, fudgy and just the right level of sweetness. They’re also really easy to put together. All in all this is one of my top favorite recipes because it’s easy to remember, it’s not overly sweet, and the brown sugar adds extra flavor. This one’s definitely in the fudgy category, though. There’s no “in-between” about it. Nick Malgieri's famous recipe for Supernatural Brownies. Preheat oven to 350 degrees F. Line a 9x13 inch metal pan with foil and grease foil. Alternatively, use parchment paper or nonstick foil. In a microwave safe bowl, combine the butter and chocolate. Microwave at 50% power, stirring ever 30 seconds, until mixture is melted and smooth. In a large mixing bowl, gently whisk together eggs, both sugars, vanilla and salt. Stir in the chocolate mixture until fully blended, then fold in the flour. Pour batter into the pan and bake on center rack for 30-35 minutes. Pull from oven and sprinkle chocolate pieces or chocolate chips over the top. Let the brownies cool completely on a rack. Grasp foil, lift from pan, put brownies on a cutting rack and cut into 16 squares or 12 bars. 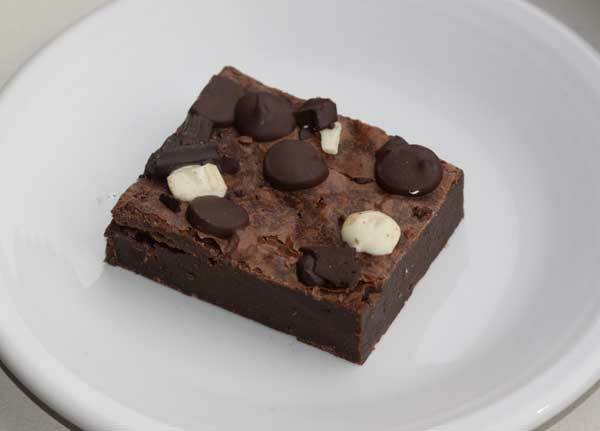 For a cleaner cut, chill brownies before slicing. I like adding M&amp;Ms right when the brownies come out of the oven.